An Amber Alert for a 6-year-old Bridgeport, Connecticut girl has been canceled and the child has been found safe. 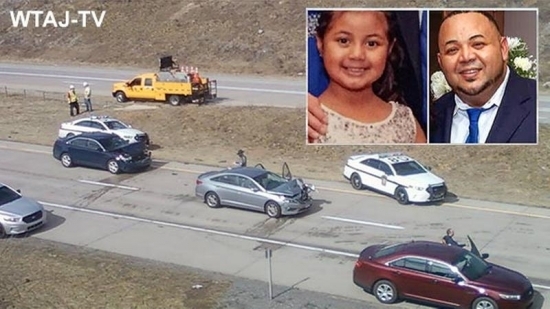 Pennsylvania State Police found 6-year-old Aylin Sofia Hernandez and her father 39-year-old Oscar Hernandez on I-99 in Centre County, Pa. after a crash around 11 a.m. Friday. The crash happened after a PA State Trooper spotted their silver Hyundai Sonata and attempted to pull Hernadez over. After a chase, the suspect crashed into the back of a tractor trailer. It began just before 3 a.m. in a Bridgeport, CT, home. Police arrived to find two female stabbing victims. Aylin's mother died from her injuries, the other female is expected to survive. Hernadez fled with his daughter prompting the Amber Alert. He is now in custody for the attack on the women. Police say it was a domestic violence incident stemming from an argument. A judge in Montgomery County has ruled that only one other accuser may testify at Bill Cosby's sexual assault trial. Prosecutors had asked the judge to allow 13 accusers to take the stand as "prior bad act" witnesses. The defense argued that these women amounted to a "casting couch" of claims dating back decades, none of which ever amounted to charges and were long past their statutes of limitations. The defense also said that that they did not match a "signature behavior" the prosecution was trying the demonstrate. The one witness allowed will testify that Cosby assaulted her in 1996 in Beverly Hills. Trial is set for June 5th in Norristown. He is accused of drugging and assaulting former Temple University employee Andrea Constand in 2004 in his Cheltenham home. There is no physical evidence, only witness testimony. The New Jersey Pinelands Commission voted 9-5-1 to approve a plan to run a natural gas pipeline through the federally protected Pinelands preserve in South Jersey. The entire proceeding was drowned out by raucous protestors opposed to the pipeline. It has been a hotly contested jobs-versus-environment debate. South Jersey Gas says the pipeline will help it's customers in Cape May and Atlantic counties, create/protect jobs, increase energy reliability, and reduce air emissions with cleaner natural gas. They plan to build under or adjacent to exist roads. Hundreds of protestors filled the meeting room. Protestors are worried it will damage the sensitive Pinelands region and set precedent for future development. They plan to go to court to block this approval. See video below. Sixer Ben Simmons will be out the rest of the season.